A winner must be chosen… by any means necessary. Playtime Season 4 continues with Episode 7: “Mano a Mano”. Things begin to heat up between Warren and Cobra as their competition continues to escalate. Andrew moves into position, ready to spring his trap! Tom and The Woaf as themselves. Want to see more Playtime? See the rest of the series here. 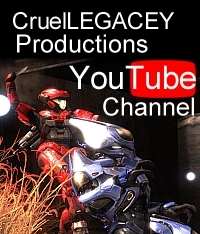 Video | This entry was posted in Episodes, Halo 4, halo reach, Playtime, Video and tagged machinima, playtime, season 4, waypoint. Bookmark the permalink. Looks pretty awesome!!! It’s funny I just came here to get the link for this website then I realized this site was a WordPress site, because I was signed into my own profile editing MY Halo site. Somewhat ironic. So now I’m commenting. The throwback music was fantastic – I wanted to stand up and cheer.